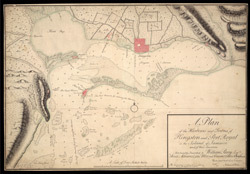 Plan of the harbours and towns of Kingston and Port Royal in Jamaica as they were in 1815. The complete harbour consists of almost landlocked area approximately 10 miles long and 2 miles wide. The surveyor, Nathaniel Watts, has coloured settlements in pink, and has marked in fathoms the different depths of the harbour. In the late 17th century Port Royal had been a large, economically prosperous town and was the central trading post in the Caribbean. However it was largely destroyed by an earthquake in 1692, leading to the founding of Kingston the following year. Kingston (which took over from Spanish Town as the capital of the island in 1872) was more difficult for vessels to reach as it was further inland and had more shallow waters. It was built on land owned by Sir William Beeston, who sold it to the Council of Jamaica for £1,000. John Goffe was employed to survey the land and he was responsible for laying it out in its regular rectangularrectilinear patternrectangular formation.